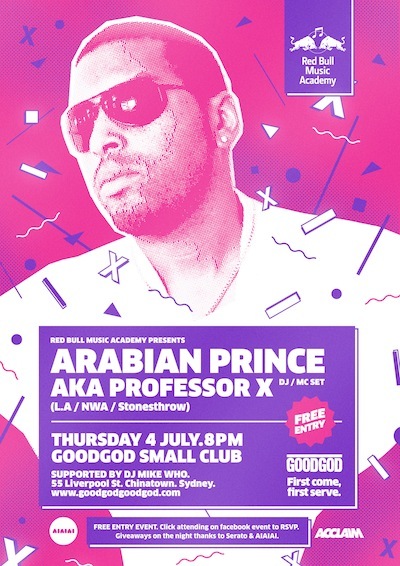 With just a few days ’til the legendary Arabian Prince (LA/N.W.A./Stones Throw) hits the Danceteria for a huge, FREE party, we’ve got an Australian tour mix to get you all warmed up! This mix explores all facets of his career, with his own material mixed in amongst a killer list of influences. Arabian Prince was a founding member of legendary rap crew NWA before branching out in his own, releasing a slew of electro-rap and proto-booty records, recently collected by Stones Throw for Innovative Life: The Arabian Prince Anthology, 1984-1989. Check it out and don’t forget to RSVP! Click here to do it, and free entry is yours! Something 2 Dance 2, N.W.A.